The Dubai Department of Tourism and Commerce Marketing (DTCM) conducted Dubai Road Shows in three Japanese cities of Tokyo, Nagoya and Osaka recently. The marketing and promotional drive offered an opportunity for Dubai tourism industry players to network with the Japanese travel industry decision-makers. Nayef Ibrahim, Head of Australia & Asia Region at DTCM’s Overseas Promotions, led the Dubai delegation which included representatives of 18 co-participants. 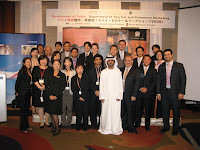 Emirates Airlines, Jumeirah Group and Desert Adventures Tourism were the co-sponsors of the road shows.